There has been a revolution in many areas of business management brought out by the increasing automation of key tasks and the outsourcing of the more menial and labor-intensive administrative functions. Across the board, professionals have largely shifted focus from task management to value-based contributions and process improvement. The shift has coincided with the automation of their functions. For example, the early automation of accounting functions, enhanced access to data, and development of financial modeling software over the 1980s and 1990s led to fundamental changes in the roles of Finance Directors and Chief Financial Officers. More recently, the shift of focus has been especially remarkable in human resources. Suddenly, HR is dedicating itself to attracting, recruiting, developing, managing, and retaining talent, predicting skills shortages, and developing and executing plans to address them. This represents a major shift from HR’s traditional function—the tactical management of personnel considerations—to the development of insight and the creation of value. Consequently, HR makes a more strategic contribution to the executive management of enterprises, especially multinational companies. And again, automation is to thank: HCM systems allow HR professionals to lessen the burden of departmental and functional management (and procedural drudgery) and seize their place at the decision makers’ table. As business trends shift and automation expands, new business areas come under scrutiny and are subsequently made accountable for the strategic value they impart, not just the efficiency of the tactical, functional, and administrative exercise of their duties. Is payroll next on the list? 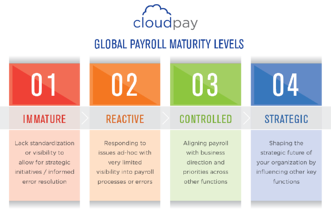 Payroll remains a tactical function in nearly every company. 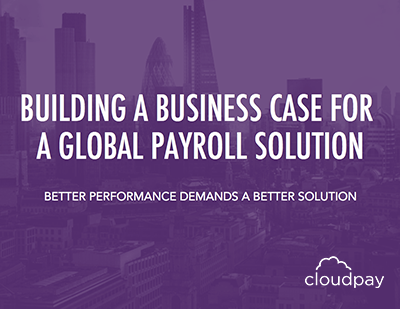 Indeed, at CloudPay, we still refer to our customers as “early adopters”, a select group with the foresight and vision to recognize that more comprehensive, automation-driven payroll management enables the global payroll function to make strategic as well as tactical contributions. Of course, it's essential to pay employees accurately and on time. Done well, and the function becomes invisible due to professionalism and the diligence of payroll managers and staff—and is therefore under-evaluated and under-appreciated. And yet, payroll represents an enormous percentage, often the highest percentage, of an organization’s total expenses. 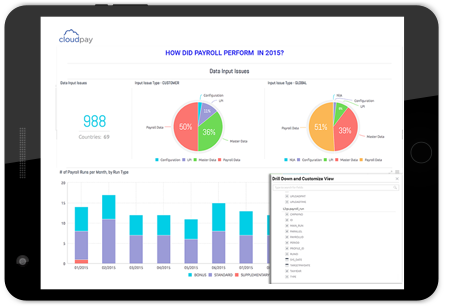 As such, payroll should be the source of a vast amount of data, chronological and geographic, demographic and functional, from which can be derived a wealth of business information and strategic insight. Payroll trend analysis and predictive analytics should provide entities real competitive advantage, underwriting the best informed decisions. But to keep pace with myriad and continual changes to the rules, policies, procedures, models, allowances and rates that govern the management of payroll locally, in each separate legislature, companies have maintained payroll staff locally or outsourced the function to local payroll providers, sometimes at a regional level but more often at the country or legislature level. This spider’s web of suppliers is usually disguised by the entire function being outsourced to an aggregator. An aggregator is one of the many international payroll providers that manage the supplier network on behalf of their clients and run the payroll function, but deliberately give little or no thought to the strategic opportunity that is being missed. The approach is antiquated, but it’s not going anywhere. Why so? Because the companies that have grown fat maintaining the status quo are unlikely to want to dismantle their castle by automating the global payroll management process, assimilating complex data sets, and providing the tools for multinationals to centrally manage and analyze their payroll while benefiting from significant efficiencies. It is in no way in the interests of the large aggregators and managed payroll outsourcers to enable or encourage payroll to become strategic. 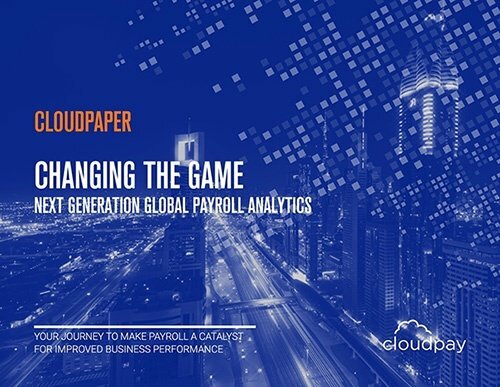 The reality of today is that aggregated global payroll solutions are writing themselves out of the future of payroll management by failing to evolve their business models—and allowing those with greater vision to disrupt the market they have considered their own since the earliest days of data processing. First, automation is currently transforming payroll as a function and a service. Until recently, no company had tackled the complexity of global payroll: the calculation of algorithms that vary from legislature to legislature and the continual state of flux as taxation models are continually adjusted for fiscal advantage by treasury departments of governments worldwide. Even if they had wanted to, until the emergence of the cloud and Software as a Service (SaaS) applications, the sheer administration of any automated solution would have proved an insurmountable obstacle given the rate of changes to the underlying algorithms. Secondly, and perhaps even more importantly, is the need to change working practice inside the departments that manage payroll in large organizations. The changes required might necessitate a change to the nature of functional management. After all, the skills to understand and manage the process will usually be different from those needed to analyze and extract business intelligence from raw data. Or are they? The executive expectation of the contribution that should be made by payroll and the influence that global payroll managers have needs to be reviewed—and shifted toward recognition of the strategic, not just the tactical, importance of payroll. The former requirement was satisfied by the advent of the cloud and SaaS application pioneered by CloudPay. The latter is, right now, being driven by the need for global payroll data assimilation to big data initiatives and, of course, the professional and corporate successes being enjoyed by the early adopters. Payroll is often subjugated within HR, just as often within Finance. Yet, payroll as a discipline, as a function, and as a strategic contributor of information, belongs to neither; it is a separate entity that is slowly developing its own voice and earning its place on the executive management committees of the world’s most far-sighted multinationals.